better define the HVM landscape with additional data from the Life Sciences sector. Strategic roadmapping techniques were used to help participants explore each sector’s key trends and drivers; the novel products, processes and services which could be developed in the future; any technologies and capabilities required to support these opportunities; and the enabling factors that would help the sector respond successfully. The list of potential new products, processes and services was prioritised to identify key areas where it was thought the most valuable opportunities for innovation exist. A ‘case for action’ was developed to justify further work in each area, outlining the potential benefits, critical gaps and steps required. 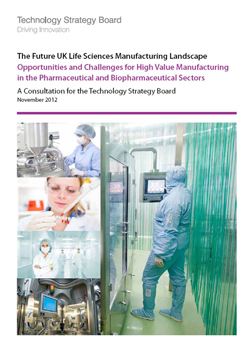 This report covers the pharmaceutical sector within Life Sciences, with separate attention given to the specific manufacturing requirements for pharmaceutical and biopharmaceutical sectors.